The Texas weather is beginning to cool down and you can’t help but get into the Fall spirit. This time of year has always been my favorite. Full of traditions, cozy sweaters, and yummy food, what’s not to like? 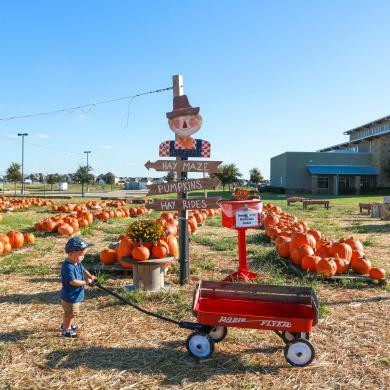 Frisco is one of the best places to start off all your Fall festivities. One of my favorite traditions is visiting the pumpkin patch. Our family has been visiting Pumpkins on the Prairie ever since we moved to Frisco. They offer a wide selection of pumpkins, all different shapes, sizes, colors and prices. As you search for the perfect pumpkin, don’t forget to use on of the many wagons accessible for your convenience. Trust me, pumpkins are a lot heavy than they look. In addition to pumpkins, they also offer face painting, hayrides, pumpkin launching, bounce houses and a hay maze. The best part? It’s all free. The only things available for purchase are the pumpkins and hay. Did I mention they also have tons of picture opportunities throughout the patch? It’s the perfect spot to snap those annual Fall photos. 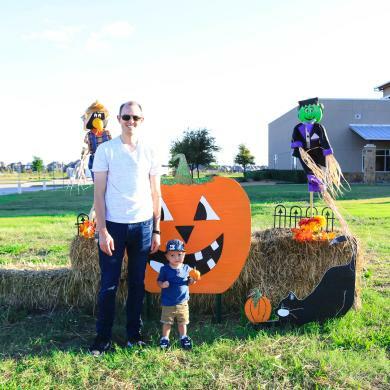 Frisco is also home to some of the best Fall festivals like, Friscovania. Located at Toyota Stadium, this annual celebration includes a runway fashion show, costume contest and several live performances. The Frisco RoughRiders also host an annual Fall Festival at Dr Pepper Ballpark. Offering a petting zoo, pumpkin painting and a trunk or treat trail, you are sure to have a spooktacular time. Both events will be held Saturday, October 27. 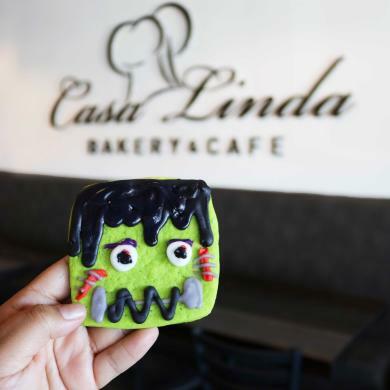 Once you have worked up an appetite, head to Casa Linda Bakery for some delicious food. With over 75 years of experience, it doesn’t surprise me that everything they make tastes delicious. Their café lunch and dinner menu are so tasty, but their bakery items are to die for. 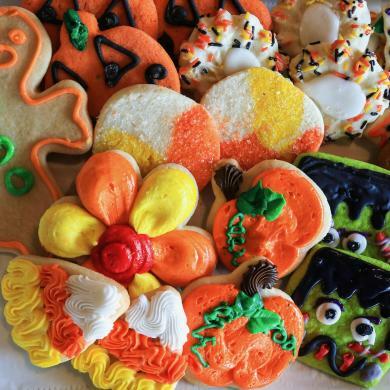 They offer cookies, cakes, pies, and pretty much anything else your heart desires. Since they are local, they proudly make everything from scratch. Casa Linda Bakery also offers catering for all your holiday and event needs. If you have a sweet tooth like me, I also recommend checking out Buttermilk Sky Pie Shop and Unrefined Bakery. Of course, no Fall wardrobe is complete without the perfect sweater. Why not take this chilly weather as an opportunity to do a little shopping? 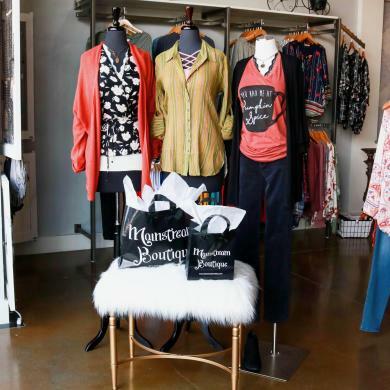 With some of the cutest boutiques around, you are sure to find the latest Fall trends in Frisco. Mainstream Boutique is one of the best places to update your Fall wardrobe. With a great selection of jackets, cardigans, boots, and hats, you are sure to find something you’ll love. The owner Michelle, is a master stylist and prides herself in helping her customers find the perfect outfit. Definitely stop by. 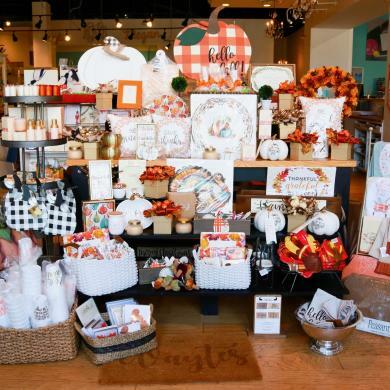 If you’re in the mood for decorating, Paper Affair sells some of the cutest Fall decorations around. They offer decorative wreaths, doormats, scented candles, throw pillows and so much more. Let me not forget to mention, they have the cutest stationary for the holidays. You will be happy you checked it out. I hope this inspired you to go out and enjoy Fall in Frisco. See you soon!